These high performance single-phase submersible pumps are ideal for job sites needing fast, dependable, low level water pumping. 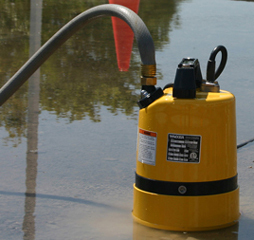 Pump can start in less than 1/4-inch of water when it is primed through the discharge port. No matter how large or small the job. Wacker Neuson submersible pumps offer the versatility and durability contractors need for light dewatering. Suitable for most 110V outlets, these pumps offer big pump features for small pump investment. Pumps feature a top discharge for efficient motor cooling and continuous operation, even when pumping at low water levels. Miniature thermal motor protector prevents overheating and dry run conditions. Multi-directional discharge coupling for vertical or horizontal hose run without kinking. PSR1 500 is ideal for dewatering of flat concrete, like basement and factory floors. 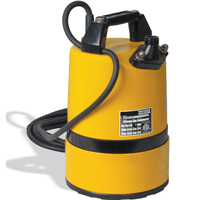 For use where a sump pump cannot be installed and water must be almost completely removed. Can handle solids up to: 1/4″.